The demand for qualified teachers is high, and no one knows better than the schools and districts struggling to find them. Teachers have been shying away from the profession due to recession and school cuts in the past years. Twenty percent of all new hires leave the classroom within three years and in urban districts, nearly half of all teachers leave within five years. What’s worse is that there are fewer entrants into the profession. California has seen a 53% drop in enrollment in the last five years. 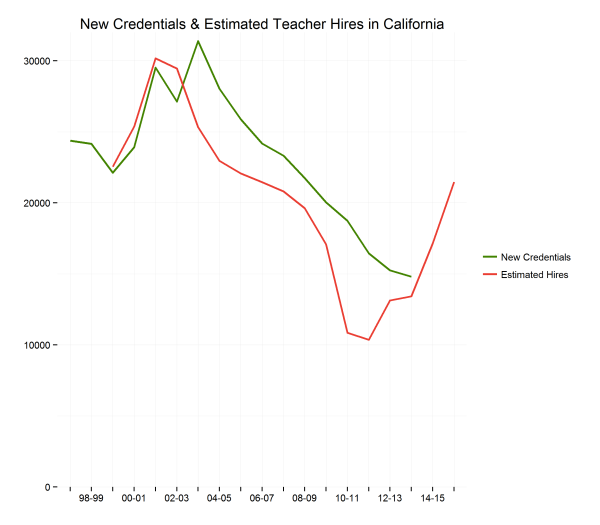 According to a report by the California Commission on Teacher Credentialing (CCTC), new teacher credentials issued by the commission dropped 30% to 11,497 in 2013-14 from 16,401 in 2009-10. 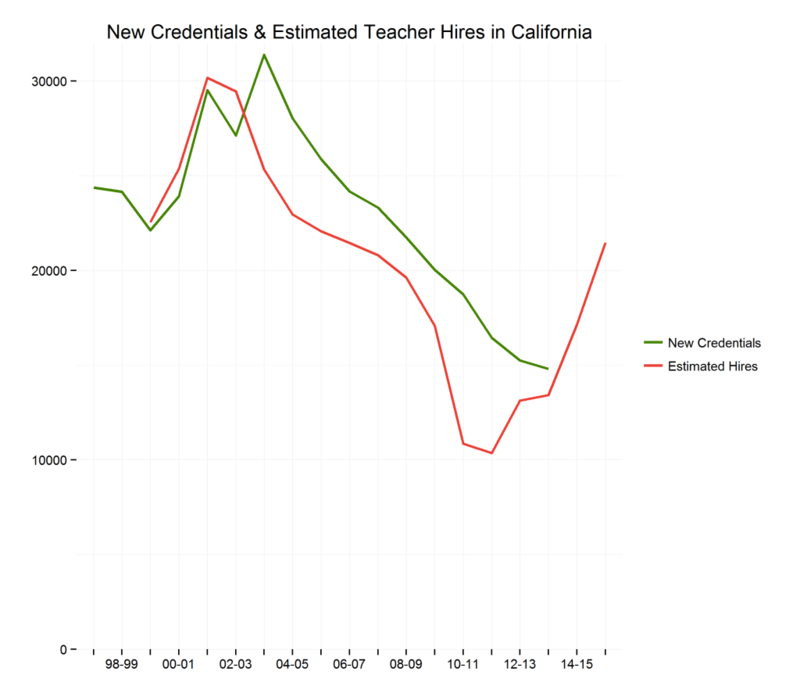 Boosting these numbers were 3,313 teachers who had been trained as teachers in other states or countries and applied for and received credentials in California. The CCTC says enrollment in teacher preparation programs dropped an alarming 74% from 2003 to 2012. The Center of the Future of Teaching and Learning estimates that California will need an additional 100,000 teachers over the next decade. Now as California schools are rebounding with increased funding thanks to the new Local Control Funding Formula (LCFF), there are not just enough teachers for all the vacancies. Many schools and districts we have spoken with have seen teachers leaving, some right before the opening of school. “It has been difficult finding qualified teachers,” said Margaret Domingo, VP of HR and Compliance at Camino Nuevo Charter Academy. Many districts and charter schools are now finding creative ways to look for qualified teachers. While some have been aggressive in advertising their positions, others have successfully tried wooing out of state teachers to come to sunny California. Teachers from Texas and other states can transition into California relatively easily and get credentialed here. Some districts, in urban areas, have enticed math and science teachers with sign-on bonuses. There has also been a debate over whether the LCFF funding can be used for teacher pay raises. While the California Department of Education cautions against use of LCFF funding for teacher pay raises, the California Teacher Association maintains that the new funding formula gives flexibility to districts in spending that includes paying competitive salaries to reduce teacher turnover. For the most part though districts and charter schools have made use of short-term credentials to put teachers into the classroom. The number of teachers given short-term and provisional permits, and so-called “intern” credentials, has risen sharply. The CCTC issued a total of 5,744 temporary permits, waivers and intern credentials in 2013-14 – a significant 2% of the total teacher workforce of 282,495. According to the CCTC report, “limited-assignment teaching permits,” that allow fully credentialed teachers to teach classes for which they lack state authorization, rose to 1,729 in 2013-14, representing a 51% increase over the previous year. Provisional internship permits (PIPs) and short-term staff permits increased by 36.7% in 2013-14 over the previous year, to a total of 1,166. A PIP is used to fill an anticipated need for which the district has not been able to find a fully qualified candidate. School districts can request short-term staff permits when they need to fill a teaching staff position immediately, for example if a teacher unexpectedly quits or becomes ill. Some lawmakers and education policy leaders like Linda Darling-Hammond, education professor at Stanford University and chair of the CCTC, have expressed concern over the teacher shortages. They have cautioned that as a state that values education and its future, this issue is vital in the overall education policy. Previous attempts in the legislature to provide more financial incentives to would-be teachers have met with resistance. While the search for longer term solutions continues, districts and charters alike are getting creative in making sure their students have qualified and motivated teachers.